For the album, see Lunch (album). "Luncheon" redirects here. For the type of cured meat, see Lunch meat. The abbreviation lunch is taken from the more formal Northern English word luncheon, which is derived from the Anglo-Saxon word nuncheon or nunchin meaning 'noon drink'. The term has been in common use since 1823. [a] The Oxford English Dictionary (OED) reports usage of the words beginning in 1580 to describe a meal that was eaten between more substantial meals. It may also mean a piece of cheese or bread. In medieval Germany, there are references to similariar, a sir lunchentach according to the OED, a noon draught – of ale, with bread – an extra meal between midday dinner and supper, especially during the long hours of hard labour during haying or early harvesting. Meals have become ingrained in each society as being natural and logical. What one society eats may seem extraordinary to another. The same is true of what was eaten long ago in history as food tastes, menu items and meal periods have changed greatly over time. For example, the word supper means bread and soup (from the German word sop- soup or stew over bread). In general, during the Middle Ages the main meal for almost everyone took place late in the morning, after several hours of work, when there was no need for artificial lighting. During the 17th and 18th centuries, this meal, called dinner, was gradually pushed back into the evening, creating a greater time gap between breakfast and dinner. A meal called lunch came to fill the gap. A formal evening meal, artificially lit by candles, sometimes with entertainment, was a supper party as late as the Regency era. Up until the early 19th century, luncheon was generally reserved for the ladies, who would often have lunch with one another when their husbands were out. As late as 1945, Emily Post wrote in the magazine Etiquette that luncheon is "generally given by and for women, but it is not unusual, especially in summer places or in town on Saturday or Sunday, to include an equal number of men" – hence the mildly disparaging phrase, "the ladies who lunch". Lunch was a ladies' light meal; when the Prince of Wales stopped to eat a dainty luncheon with lady friends, he was laughed at for this effeminacy. The remains of cold joints, nicely garnished, a few sweets, or a little hashed meat, poultry or game, are the usual articles placed on the table for luncheon, with bread and cheese, biscuits, butter, etc. If a substantial meal is desired, rump-steaks or mutton chops may be served, as also veal cutlets, kidneys... In families where there is a nursery, the mistress of the house often partakes of the meal with the children, and makes it her luncheon. In the summer, a few dishes of fresh fruit should be added to the luncheon, or, instead of this, a compote of fruit or fruit tart, or pudding. With the onset of industrialisation in the 19th century, male workers began to work long shifts at the factory, severely disrupting the age-old eating habits of rural life. Initially, workers were sent home for a brief dinner provided by their wives, but as the workplace was moved farther from the home, working men took to providing themselves with something portable to eat during a break in the middle of the day. The lunch meal slowly became institutionalised in England when workers with long and fixed hour jobs at the factory were eventually given an hour off work to eat lunch and thus gain strength for the afternoon shift. Stalls and later chop houses near the factories began to provide mass-produced food for the working class, and the meal soon became an established part of the daily routine, remaining so to this day. In many countries and regions lunch is the dinner or main meal. Prescribed lunchtimes allow workers to return to their homes to eat with their families. Consequently, where lunch is the customary main meal of the day, businesses close during lunchtime. Lunch also becomes dinner on special days, such as holidays or special events, including, for example, Christmas dinner and harvest dinners such as Thanksgiving; on these special days, dinner is usually served in early afternoon. Among Christians, the main meal on Sunday, whether at a restaurant or at home, is called "Sunday dinner", and is served after morning church services. A traditional Bengali lunch is a seven-course meal. Bengali cuisine is a culinary style originating in Bengal, a region in the eastern part of the Indian subcontinent, which is now divided between Bangladesh and Indian states of West Bengal, Tripura, Assam's Barak Valley. The first course is shukto, which is a mix of vegetables cooked with few spices and topped with a coconut sauce. The second course consists of rice, dal, and a vegetable curry. The third course consists of rice and fish curry. The fourth course is that of rice and meat curry (generally chevon, mutton, chicken or lamb). The fifth course contains sweet preparations like rasgulla, pantua, rajbhog, sandesh, etc. The sixth course consists of payesh or mishti doi (sweet yogurt). The seventh course is that of paan, which acts as a mouth freshener. In China today, lunch is not nearly as complicated as it was before industrialisation. Rice, noodles and other mixed hot foods are often eaten, either at a restaurant or brought in a container. Western cuisine is not uncommon. It is called 午餐 or 午饭 in most areas. Lunch in Denmark, referred to as frokost, is a light meal. Often it includes rye bread with different toppings such as liver pâté, herring, and cheese. 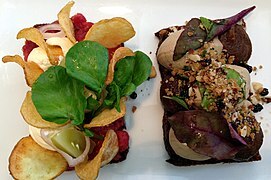 Smørrebrød is a Danish lunch delicacy that is often used for business meetings or special events. In Finland, lunch is a full hot meal,[b] served as one course, sometimes with small salads and desserts. Dishes are diverse, ranging from meat or fish courses to soups that are heavy enough to constitute a meal. In France, the midday meal is taken between noon and 2:00 pm. In Germany lunch is the main meal of the day. [c] It is traditionally a substantial hot meal, sometimes with additional courses like soup and dessert. It is usually a savoury dish, consisting of protein (e.g., meat), starchy foods (e.g., potatoes) and vegetables or salad. Casseroles and stews are popular as well. There are a few sweet dishes like Germknödel or rice pudding that can serve as a main course, too. Lunch is called Mittagessen – literally, "midday's food". In the Netherlands, Belgium and Norway, it is common to eat sandwiches for lunch: slices of bread that people usually carry to work or school and eat in the canteen. The slices of bread are usually filled with sweet or savoury foodstuffs such as chocolate sprinkles (vlokken), apple syrup, peanut butter, slices of meat, cheese or kroket. The meal typically includes coffee, milk or juice, and sometimes yogurt, some fruit or soup. It is eaten around noon, during a lunch break. In Portugal, lunch (almoço in Portuguese) consists of a full hot meal, similar to dinner, normally with soup, meat or fish course, and dessert. It is served between noon and 2:00 pm. It is the main meal of the day throughout the country with the exceptions of the Metropolitan areas of Lisbon and Porto, where lighter meals or snacks are not uncommon. The Portuguese word lanches derives from the English word "lunch", but it refers to a lighter meal or snack taken during the afternoon (around 5 pm) due to the fact that, traditionally, Portuguese dinner is served at a later hour than in English-speaking countries. In Spain, the midday meal, "lunch" takes place between 1:00 pm and 3:00 pm and is effectively dinner, (the main meal of the day); in contrast, supper does not usually begin until between 8:30 pm and 10:00 pm. Being the main meal of the day everywhere, it usually consists of a three-course meal: the first course usually consists of an appetizer; the main course of a more elaborate dish, usually meat- or fish-based; the dessert of something sweet, often accompanied by a coffee or small amounts of spirits. Most places of work have a complete restaurant with a lunch break of a least an hour. Spanish schools have a complete restaurant as well, and students have a one-hour break. Three courses are common practice at home, workplace, and schools. Most small shops close for between two and four hours – usually between 1:30 pm to 4:30 pm – to allow to go home for a full lunch. In the United Kingdom, lunch is often a small meal, designed to stave off hunger until returning home from work and eating dinner. It is usually eaten early in the afternoon. Lunch is often purveyed and consumed in pubs. Pub lunch dishes include fish and chips, ploughman's lunch and others. In Hungary, lunch is traditionally the main meal of the day, following a leves (soup). In Poland the main meal of the day (called obiad) is traditionally eaten between 1:00 pm and 5:00 pm,[d] and consists of a soup and a main dish. Most Poles equate the English word "lunch" with "obiad" because it is the second of the three main meals of the day; śniadanie (breakfast), obiad (lunch/dinner) and kolacja (dinner/supper). There is another meal eaten by some called drugie śniadanie, which means "second breakfast". Drugie śniadanie is eaten around 10:00 am and is a light snack, usually consisting of sandwiches, salad or a thin soup. In Russia, the midday meal is taken in the afternoon. Usually, lunch is the biggest meal[e] and consists of a first course, usually a soup, and a second course which would be meat and a garnish. Tea is standard. In Bosnia and Herzegovina, lunch is the main meal of the day. It is traditionally a substantial hot meal, sometimes with additional courses like soup and dessert. It is usually a savoury dish, consisting of protein (such as meat), starchy foods (such as potatoes), and a vegetable or salad. It is usually eaten around 2:00 pm. In Romania, lunch (prânz in Romanian) is the main hot meal of the day. It is usually eaten at 12:00, but never later than 3:00 pm. Lunch normally consists of two dishes: usually, the first course is a light soup and the second course, the main course, often consists of meat accompanied by potato, rice or pasta (garnitură) Traditionally, people used to bake and eat desserts, but nowadays it is less common. 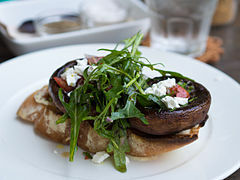 On Sundays, the lunch is more consistent and is usually accompanied by an appetiser or salad. In the West Asia (Middle East) and in most Arab countries, lunch is eaten between 1:00 pm and 4:00 pm and is the main meal of the day. It usually consists of meat, rice, vegetables and sauces and is sometimes but not always followed by dessert. Lunch is also eaten as a light meal at times in the West Asia(Middle East), such as when children arrive at home from school while the parents are still out working. Water is commonly served, which may be iced, and other beverages such as soft drinks or yogurt drinks are also consumed. In the United States and Canada, lunch is usually a moderately sized meal generally eaten around noon. During the work week, North Americans generally eat a quick lunch that often includes some type of sandwich, soup, or leftovers from the previous night's dinner (e.g., rice or pasta). Children often bring packed lunches to school, which might consist of a sandwich such as bologna (or other cold cut) and cheese, tuna, chicken, or peanut butter and jelly, or, in Canada, savoury pie, as well as some fruit, chips, dessert and a drink such as juice, milk, or water. Adults may leave work to go out for a quick lunch, which might include some type of hot or cold sandwich such as a hamburger or "sub" sandwich. Salads and soups are also common, as well as a soup and sandwich, tacos, burritos, sushi, bento boxes, and pizza. Lunch may be consumed at various types of restaurants, such as formal, fast casual and fast food restaurants. Canadians and Americans generally do not go home for lunch, and lunch rarely lasts more than an hour except for business lunches, which may last longer. In the United States the three-martini lunch – so called because the meal extends to the amount of time it takes to drink three martinis – has been making a comeback since 2010. Businesses can deduct 80% of the cost of these lunches. Children generally are given a break in the middle of the school day to eat lunch. Public schools often have a cafeteria where children can buy lunch or eat a packed lunch. Boarding schools and private schools, including universities, often have a cafeteria where lunch is served. In Mexico, lunch (Comida) is usually the main meal of the day and normally takes place between 2:00 pm and 4:00 pm. It usually includes three or four courses: the first is an entrée of rice, noodles or pasta, but also may include a soup or salad. The second consists of a main dish, called a guisado, served with one or two side dishes such as refried beans, cooked vegetables, rice or salad. The main dish is accompanied by tortillas or a bread called bolillo. The third course is a combination of a traditional dessert or sweet, café de olla, and a digestif. During the meal, it is usual to drink aguas frescas, although soft drinks have gained ground in recent years. In Australia, a light meal eaten in the period between 10:30 am and noon is considered brunch; an actual lunch will be eaten between 12 and 2PM. While usually consisting of fruit or a cereal product, a typical Australian brunch may include other foods as well such as burgers, sandwiches, other light food items, and hot dishes. Sometimes a meal during the late afternoon is referred to as "afternoon tea", a meal in which food portions are usually significantly smaller than at lunch, sometimes consisting of nothing more than coffee or other beverages. In Argentina, lunch is usually the main meal of the day, and normally takes place between noon and 2:00 p.m. People usually eat a wide variety of foods,[f] such as chicken, beef, pasta, salads, and a drink like water, soda or wine, and some dessert. Although at work, people usually take a fast meal which can consist of a sandwich brought from home or bought as fast food. In Brazil, lunch is the main meal of the day,[g] taking place between 11:30 a.m. and 2:00 p.m. Brazilians basically eat rice with beans, salad, french fries, some kind of meat or pasta dishes. But the kind of food may vary from region to region. Since lunch typically falls in the early-middle of the working day, it can either be eaten on a break from work, or as part of the workday. The difference between those who work through lunch and those who take it off could be a matter of cultural, social class, bargaining power, or the nature of the work. Also, to simplify matters, some cultures refer to meal breaks at work as "lunch" no matter when they occur – even in the middle of the night. This is especially true for jobs that have employees that rotate shifts. ^ The OED gives a first usage in 1591. ^ a b "In Norway and Denmark the common lunch is based on sandwiches, whereas in Finland and Sweden the hot lunch is the norm." ^ "Traditionally, lunch would be the main meal of the day. In the domestic arena, modern working practices have changed this considerably, although many restaurants still tout lunchtime dishes or a fixed lunch menu Gedeck or Tagesmenü." ^ "Obiad is closer to a Western dinner, but the timing is more like lunch. You could say it's a dinner at lunchtime." ^ "Lunch, according to an earlier Russian tradition, was the main meal of the day. A light lunch is usually taken at work." ^ "Lunch and dinner are both hearty and for prosperous urban families may include a soup, an order of cold meat, a main course of meat with potatoes and green vegetables, a salad, and a dessert." ^ "In most of Brazil, the big meal of the day is served at noon." ^ Alan Davidson (21 August 2014). The Oxford Companion to Food. OUP Oxford. p. 478. ISBN 978-0-19-104072-6. ^ Alan Davidson (2014). The Oxford Companion to Food. Oxford University Press. p. 478. ISBN 9780191040726. ^ Megan Elias (6 March 2014). Lunch: A History. Rowman & Littlefield Publishers. p. vii. ISBN 978-1-4422-2747-7. ^ Sheilah Kaufman (2007). Upper Crusts: Fabulous Ways to Use Bread : Delectable Recipes for Appetizers, Soups, Salads, Main Courses, Desserts and More. Capital Books. p. 53. ISBN 978-1-933102-39-9. ^ a b c McMillan, Sherry (2001). "What Time is Dinner?". History Magazine. Retrieved 11 August 2007. ^ The Book of Household Management. Farrar, Straus, and Giroux. 1861. p. 959. ^ "Breakfast, lunch and dinner: Have we always eaten them?". BBC. Retrieved 15 March 2016. ^ Crotty, Jim (1997). How to Talk American: A Guide to Our Native Tongues. Houghton Mifflin Harcourt. pp. 190–. ISBN 0-395-78032-2. Retrieved 13 March 2016. ^ Hansen, Anders Oreby (2005). Denmark in International Tax Planning. IBFD Publications. p. 27. ISBN 978-90-76078-73-1. Retrieved 15 March 2016. ^ Ken Albala (2011). Food Cultures of the World Encyclopedia. ABC-CLIO. p. 98. ISBN 978-0-313-37626-9. Retrieved 15 March 2016. ^ Richard Sale (February 2007). Copenhagen and Denmark. New Holland Publishers. p. 29. ISBN 978-1-84537-634-5. ^ R. W. Apple, Jr. (7 December 2010). Far Flung and Well Fed: The Food Writing of R.W. Apple, Jr. St. Martin's Press. p. 347. ISBN 978-1-4299-2902-8. ^ Fogelholm, M. (2001). Physical Activity: a Part of Healthy Eating? : Report from a Nordic Seminar, Lahti, Finland, February 2000. TemaNord: Food. Nordic Council of Ministers. p. 52. ISBN 978-92-893-0658-4. Retrieved 15 March 2016. ^ Carole Lisa Albyn (January 1993). The Multicultural Cookbook for Students. ABC-CLIO. p. 142. ISBN 978-0-89774-735-6. ^ Julia Abramson (2007). Food Culture in France. Greenwood Publishing Group. p. 108. ISBN 978-0-313-32797-1. Retrieved 15 March 2016. ^ Schulte-Peevers, A.; Gray, J. (2007). Germany. Country Guides. Lonely Planet. p. 84. ISBN 978-1-74059-988-7. Retrieved 15 March 2016. ^ a b Holly R. Carter (1 January 2004). The Essential Guide for Study Abroad in the United Kingdom. University Press of America. p. 45. ISBN 978-0-7618-2846-4. ^ Carter, H.R. (2004). The Essential Guide for Study Abroad in the United Kingdom. G - Reference, Information and Interdisciplinary Subjects Series. University Press of America. p. 45. ISBN 978-0-7618-2846-4. Retrieved 15 March 2016. ^ Long, L.M. (2015). Ethnic American Food Today: A Cultural Encyclopedia. Ethnic American Food Today. Rowman & Littlefield Publishers. p. 279. ISBN 978-1-4422-2731-6. Retrieved 15 March 2016. ^ Bedford, N. (2008). Poland. Ediz. Inglese. Country Guides (in Turkish). Lonely Planet. p. 65. ISBN 978-1-74104-479-9. Retrieved 15 March 2016. ^ Albala, K. (2011). Food Cultures of the World Encyclopedia. Food Cultures of the World Encyclopedia. Greenwood. p. 310. ISBN 978-0-313-37626-9. Retrieved 15 March 2016. ^ Oprea, T. (2003). Romania. Countries of the World (in Polish). Gareth Stevens Pub. p. 40. ISBN 978-0-8368-2367-7. Retrieved 15 March 2016. ^ a b Heine, P. (2004). Food Culture in the Near East, Middle East, and North Africa. Food culture around the world. Greenwood Press. pp. 105–106. ISBN 978-0-313-32956-2. Retrieved 15 March 2016. ^ Staff writer (30 September 2010). "The Return of the Three-Martini Lunch". Bloomberg. Retrieved 14 March 2016. ^ Alison Mitchell (24 July 1999). "House Puts 'Three-Martini Lunch' Tax Break Back on the Table". The New York Times. Retrieved 14 March 2016. ^ Whittle, J. (1998). Argentina Business: The Portable Encyclopedia for Doing Business with Argentina. Country Business Guide Series. World Trade Press. p. 162. ISBN 978-1-885073-75-4. ^ Weil, T.E. ; Munson, F.P. (1974). Area handbook for Argentina. Pamphlet. Supt. of Docs., U.S. Govt. Print. Off. p. 135. ^ Klepper, N.; Edmonds, A.C. (1992). Our Global Village - Brazil: Brazil. Our Global Village. Milliken Publishing Company. p. 14. ISBN 978-1-55863-265-3. Chisholm, Hugh, ed. (1911). "Luncheon" . Encyclopædia Britannica (11th ed.). Cambridge University Press. This page was last edited on 8 April 2019, at 15:38 (UTC).